Rare communities of lichens have been discovered in the Cairngorms National Park. Bellemerea alpina had not previously been seen in Britain for more than 30 years, despite attempts by lichenologists. There are only two previous records of the other species, sporastatia testudinea, in Scotland. 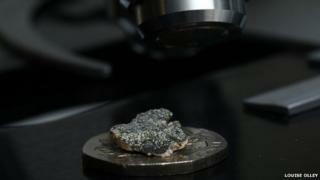 The finds were made by Dr Rebecca Yahr, a lichen biodiversity scientist at the Royal Botanic Garden Edinburgh (RBGE). Experts from RBGE and Scottish Natural Heritage (SNH) along with amateur botanists have been looking for the lichens. RBGE described the newly discovered communities as "botanical gems". Not classed as plants, lichens are made up of two or more closely interacting organisms - fungus and photobionts. They are used by scientists to monitor for pollution. RBGE said the importance of lichens to science was often overlooked. Dr Yahr said: "In light of what we discovered, there is new impetus to find what else has so far been missed." David Genney, of SNH, added: "Finding these species demonstrates how much we still have to discover in the Scottish mountains. "These discoveries also come at a time when there are uncertainties as to how species will respond to climate change, so further research and survey in our uplands is as important as ever." Bellemerea alpina is described as critically endangered on the International Union for Conservation of Nature Red List. Sporastatia testudinea is considered to be a "near threatened, nationally rare species" by UK botanists. Little is known about its ecology. In 2008, a rare lichen previously thought to occur only in Alaska, Oregon, Chile, New Zealand and Tasmania was found thriving in the north west Highlands. Experts were surprised by the discovery of micarea prasinella, which spotted on the Dundonnell estate and was new to both Scotland and Europe.